I’m not here to bury Beaujolais Nouveau — many have tried to do that already, and to little avail — but I’m not here to praise it, either. Designed for immediate gulping to celebrate the Beaujolais harvest (internationally), the cheap and cheerful Nouveau does have its place, despite all the marketing hype, and especially as an excuse for a party (hangover guaranteed!). Depending on the producer and vintage, it can be a decent quaffer or aperitif, best slightly chilled. But given the timing —Thanksgiving is exactly one week after Beaujolais Nouveau’s annual official release — and coupled with its wide availability, the Nouveau is considered by some a Thanksgiving thing, similar to, say, a Butterball turkey (yikes). And hey, at $8.99 a bottle, why not? This is where I take a stand. Beaujolais (and its Gamay grape) is a savvy choice to accompany the Great American Feast, but please, skip the dumbed-down Nouveau version. The Beaujolais Nouveau marketing machine obscures what wine cognoscenti have been discovering for some time: the expanding excellence and compelling value in the higher Beaujolais classifications, both for Beaujolais Villages (thirty-nine villages in the north of the district have the right to this appellation) and, moreover, the ten northern hillside Beaujolais “Crus”: St. Amour, Juliénas, Chénas, Moulin-à-Vent, Chiroubles, Fleurie, Morgon, Régnié, Cote de Brouilly,and Brouilly. A quick word here about Beaujolais’ über-negociant/producer, Georges Deboeuf. 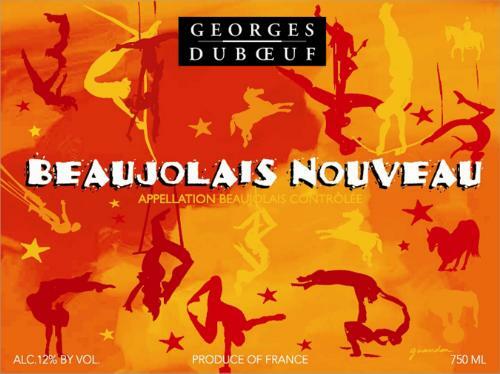 Best known for his ubiquitous Nouveau release (and the colorful, arty labels), Deboeuf’s product line runs the gamut of Beaujolais appellations, including the “flower label” Beaujolais-Villages and Crus, his Prestige Cuvees and esteemed Crus from specific Chateaux and Domaines in his portfolio, e.g. the estimable Chateau des Capitans (Juliénas), and the Jean-Ernest Descombes (Morgon). And while the flower labels are certainly large production, commercially-calibrated wines sourced from many growers, the overall quality, consistency and availability of these wines are solid, making them safe bets (around $15), and significant step up from Nouveau (Duboeuf’s included). The most compelling wines in Beaujolais, however, are found among the smaller, more artisanal (and often organic/natural) Cru producers. Yes, these are more expensive ($20 – $35, and up), but they can be amazingly expressive, energetic and bloody drinkable — wines that truly compliment a diverse meal with complex flavors, like Thanksgiving. 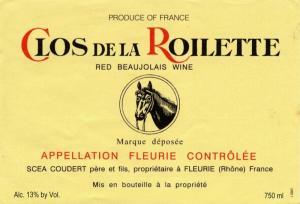 Year in and out, one of my go-to Crus is Clos de la Roilette’s Fleurie. Definitely on the rustic side (from clay and granitic soils), the Roilette generally has fine tannins and structure, vibrant black briar fruit and a long, earthy finish. It’s a serious food wine, which can also age nicely, all for around $20.00. 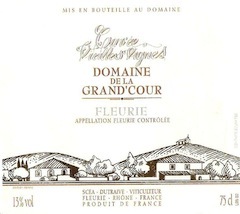 Another Fleurie, but very different stylistically, is the Jean-Louis Dutraive Domaine de la Grand’Cour Cuvee Vielles Vignes 2011, which I sampled just last week. Made with organically grown grapes from 60-70 year-old vines, it had an intense berry fruit nose with floral, minty and earthy notes, and a palate of strawberry preserves and silky tannins, finishing clean and minerally. A pretty, hedonistic wine of medium body and superb balance, which partnered brilliantly with roast cinnamon chicken. At $26, it’s a bargain. 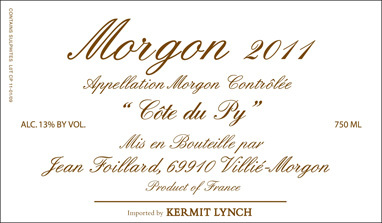 At the top of my list, and truly a world-class wine, is the Foillard Morgon Cote du Py. The “Cote du Py” is a hallowed slope of granite and schist outside the village of Villié-Morgon, the source of some great Morgons. And the Foillard is memorable: deep and lush, with fine tannins, supple dark berry fruit, hints of spice and an electric, focused (and irresistible) energy. Cellar worthy? Absolutely, but it drinks beautifully on release, too. The only downside: a relatively small production. Crush Wine and Spirits (in Manhattan)gets an annual allotment, and sells it for around $35 a bottle. For the Beaujolais region overall, the vintages 2009-11 were all outstanding — a real winning streak — so it’s hard to go wrong with any of those years, which are the current releases for most Crus. 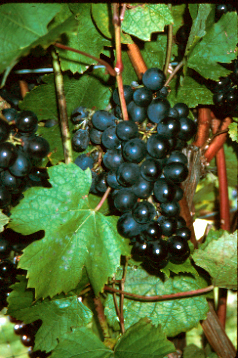 The 2012 vintage was tricky weather-wise, but apparently good quality resulted, too, on significantly lower yields. A toast, then, to the Crus, a welcome addition to any Thanksgiving table. This entry was posted in Wine, Wine + Food and tagged Beaujolais Crus, Beaujolais Nouveau, Beaujolais Villages, Clos de la Roilette Fleurie, Crush Wine and Spirits, Foillard Cote du Py Morgon, Gamay Noir, Georges Duboeuf, Jean-Louis Dutraive Fleurie, Thanksgiving wine. Bookmark the permalink.